I just read a good article called Ease Mounting Pressures on Your Horse by Karen Smith in the magazine Dressage Today, that makes me think about the ongoing tension between mounting and working toward independence withing therapeutic riding. Stirrup pressure pulls the saddle toward the rider/ground on the mounting rise, twisting the horse’s body. The horse’s body design (long with leg pairs close together) makes him stable front to back, but not stable side to side – and we mount from the side, where he is less stable. When the saddle is pulled to the side, it creates pressure against the horse’s spine, withers and muscles. The horse’s right side muscles sink to avoid the panel pressure, while the horses’s left side muscles bulge up to support the rider’s weight. This torques the horse’s body. Gathering the reins tight restricts the horse’s use of his neck (and therefore whole body) to rebalance. More pressure can be caused by the rider being short, heavy, or uncoordinated, or the horse being tall, high withered having a pronounced spine, round-barreled (so the saddle slips onto the withers), or a loose girth. All the above can cause behavior issues in the horse, or cause or worsen chronic back pain in the horse. Mounting puts the rider in a precarious, vulnerable position. Any imbalance or horse behavior problems heightens the risk of falling off. Granted, this is not the most graceful mount in the world – however, most of us are not the most graceful people. A correct leg up puts the rider above the horse and lets them lower straight down on the saddle with their weight evenly distributed, without pulling on the saddle or torquing the horse’s back. For this reason it’s often the least stressful for horses. If you are agile and springy, you can vault yourself into the saddle, bypassing the stirrup pressure altogether. This includes blocks, ramps, lifts, and lift systems. Often the rider doesn’t use the stirrup at all to mount, since the adaptation puts them high enough they can descend directly onto the saddle without torquing the horse’s back (supposedly, but it often still happens if the rider lands not centered). I haven’t heard on any studies done on the amounts of pressure put on the horse by adapted mounting options, and would be interested to see this done. 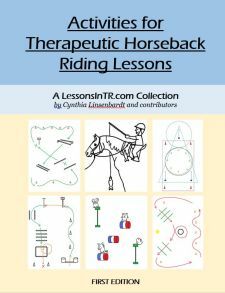 So my question is: how do you balance keeping therapeutic riding horses comfortable with teaching your riders to be as independent as possible? I have a cool modified mount to share. I saw this rider at a barn I visited, who has little muscle down her back and legs. She can support herself side to side, but not front to back. If she falls forward she must use her hands to catch herself as she cannot use her back muscles. She has no cognitive disability, and wants to become completely independent. As the mentor said about such riders, “They have the right to make choices, and you have the right to keep it safe.” So together they came up with the following system for her to mount independently. I thought it was so neat. Also note this rider is so light the saddle barely moved, and the horse did not act uncomfortable at all. Halt the horse with the stirrup just in front of stair block, alongside it instead of in front of it so she can support herself on the horse as she steps up the stairs – note horse must be the right height and temperament. Put the left foot in the stirrup, as usual. Instead of swinging the right leg over, bring it between the left leg and saddle, turning to sit sideways on the horse. Finish with a crest mount on her own, taking her leg over the crest. Crest mount on own, take leg over crest to the other side. She needs a horse with lateral movement, not anterior/posterior. She should use a crop to support her leg aids, however she prefers to have her hands free to catch herself if she falls forward so she likes using the western saddle strings to flick instead. She usually uses neck reining to keep a hand on the horn, but it was suggested she switch to two rein steering because it keeps symmetry in the trunk, improving balance and core strength. 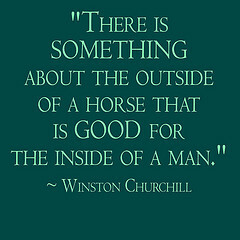 So, how do you balance working toward independence and your horses’ comfort? Please share!